As you may have noticed it is that time of year again, everything is getting ready to switch over, and while it isn’t the end of the world… cough cough* lol, and somethings won’t change even with all your New Year’s resolutions, a few things are, and have. Recently I have been working hard to transition FE Energy, from making only virtual content, to real world items and products for you guys to enjoy. Right now I am starting with the simpler stuff, and eventually I will be working my way to more and more complex items via production of 3D print, and cnc machines etc. You will also notice that the website has also changed dramatically from our old flash based website, to html5. It also has a much simpler, cleaner and efficient layout. These are just the start of some of the things to come, in the meantime check out some of the new stuff in the store, shoot me an email or message with your feed back, and have a Merry Christmas! 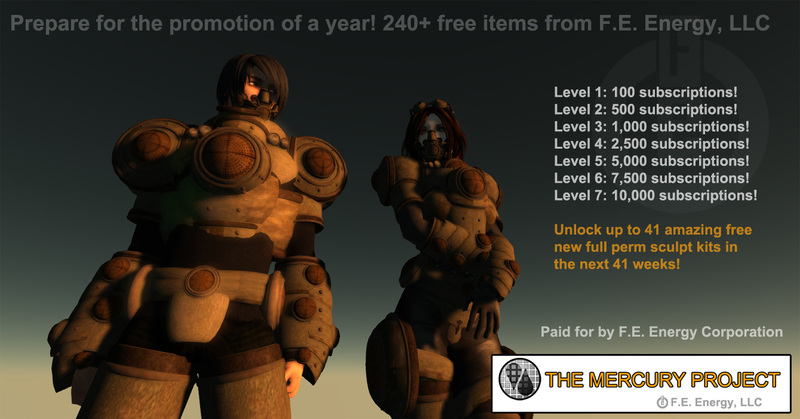 FE 2012 Promo – 241 Free Items?! Who doesn’t love something free these days!? Failed Inventor is giving out 200 free items, delivered through his group or unlocked one per day at his sim! used by over 30,000 users in SL! Soon to be providing mesh items! FREE full perm sculpt kits can be unlocked via the following goals! Goals can be completed in any order! A chance @ 41 free full perm sculpt kits over next 41 weeks! We have nearly reached the middle of 2012, and it isn’t the end of the world! We are going through some important changes, one of the great things about F.E. Energy, LLC is its versatility and ability to change direction as necessary to adapt to new things and server our customers better. To do this we will be doing the following things listed below. Reviving the F.E. Energy, LLC / Second Life Group. Providing regular weekly updates via group, subscribo’matic, linkedin, twitter, facebook, plurk, koinup, google+, deviantart, shapeways and more. Releasing 1 free promotional item daily for the next 200 days! Offering tier REWARDS for subscribers by reaching subscription goals. Working on community building for our product brand. Looking for ways to involve developers, creators, customers and others to better serve our customers. We are also launching a new full sim @ http://maps.secondlife.com/secondlife/Hangover%20Bay/171/139/27 on June 1st! Which is shared with the brands Little Red, and English Muffin. More Details will be released in the very very near future! Based on customer feedback and sales over the past few weeks since soft launch of some mesh products, some changes are coming which you should enjoy! Recognizing not every user has the same skill level or time for creating content three separate tier systems have been created to better fit our products to customers. I will be teaming up with a texture artist who does some pretty great work who will be making the seam markings, as i feel a texture specialist will better provide marked seams so maps come out in a way that is easy to texture and use for content creators. Additionally Tier 0 items will tie in with some of the tutorials and lessons I would like to produce for those just getting into the basics of using 3D editors. Thats all for now, cheers! The World In Your Hand for a Dollar! We have come a long way with technology, ever changing and ever growing and as a business it is our mission to keep our model and function alive and adapting with current trends and user needs. I have thought about how we do business lately both as a customer, and as a developer, a solution provider and as a client. The dynamics are complex, yet can be so simple. Those with the best service and good brand recognition succeed. Most of you know F.E. Energy, LLC through its start in Second Life ( created by Linden Labs ) some of you are clients, but more than likely you are one of the over 30,000+ customers and growing who use our products in virtual worlds and open sim grids a like every day! The mission in the past year is to provide continued service to SL users through continuation of development of sculpt kits. We recently have made so many we have had to divide up our products by type and category into subsidiary brands or mini stores on market place. Additionally within the last year we have been producing real life products, from traditional 2D artwork, to coffee mugs, mouse pads and even Jewelry! But the largest push has been to reach and provide service for our content developers on EVERY platform at the same time. While logistical issues has slowed the progress of our move into Unity 3D we are almost there, products are ready but there seems to be issues with the submission process to their asset store. So therefore as soon as that has been fixed we will announce our official launch onto Unity 3D asset store. We also have been testing multiple e-commerce solutions over the past year, packaging, customer interface etc.for you to buy directly from our website. We feel it is now ready. On our homepage you can now purchase the .OBJ files of our model kits right on the home page of the company website. When you go to shop through our inventory you will notice something strange, but it is no mistake, EVERYTHING!!! Is only 1USD$? Why? Cause that is all we really need per item we sell. We want to provide an affordable solution to everyone, you will also notice mesh kits on SL are priced similar as well. FE Energy will be building a large library of thousands of common game asset models over the next year for you to purchase, each of them will be soon categorized in the shop and all sold for only 1USD$ per model or kit. It is my hope by providing something that is accessible and affordable by all our customers this will reduce piracy of our content, and allow users to get what they need without breaking their budget. I want to thank you all for reading, stop by the shop, keep in mind more is on its way, oh and feel free to request items you want to see in the shop! Hey Everyone, first of all happy 2012! Hopefully this year will be exciting for everyone! It has been since November since our last update due to contract workloads, contracts and some new stuff being developed. For 2012 we are focusing primarily on development of asset kits for the Unity 3D platform, and also real life products, as we continue our move away from purely virtual world content development kits. We will be making our kits available in mesh, there will still be limited releases of new sculpt kits and various other items from time however. What we hope to accomplish on the Unity 3D platform. Our kits have been useful to over 30,000+ customers around the world in virtual worlds and social platforms. But we are ready to step into the arena of development kits for mobile app and online game content creators. Just as before we look to enrich and expedite the creative process for our customers on this platform, and other platforms which use industry standard models for game, entertainment, industrial and other developments. Additionally this year will be important as we look at building merchandise for real life use and enjoyment, as well as the potential methods for developing real life building kits! We want to enable people to build things in the real world as well! Tangible, functional and fun looking items for day to day use in their lives. This is an important goal as it really begins to involve more than just the tech savvy and computer literate generation. More posts and update to come in the next few weeks! Cheers everyone! Wow once again a long time since the last update. However some awesome news! #1 Sculpt Kits are back and being released again! #2 We ae making real world items! OMG! Really?! Yes really! We have started by making by making jewelry but plan to do all sorts of stuff! You can check them out here!